Middle School Boys Season Begins Jan. 5th! ‘Tis the season, the season for swimming that is! The middle school boys kick off their season January 5th, right after Winter Break comes to an end. The Rails middle school boys’ program is offered to middle schoolers (6th-8th grade) in Norwalk, Carlisle and the southside of Des Moines. All athletes compete against other middle school teams around the Des Moines Metro. These meets are structured similarly to high school meets and the boys have the opportunity to swim at a citywide meet and earn medals at the end of season. See the full details and how to register below. Visit your middle school office for a sign-up form. Return the completed form and $10 fee to the office or bring it to practice. Swimming is a great sport, particularly at Lincoln! The high school men’s team has a rich tradition of sending athletes to state and having a winning record. In fact, the guys are currently 4-0 on the season. Invite your friends to give swimming a try and become a part of the team. 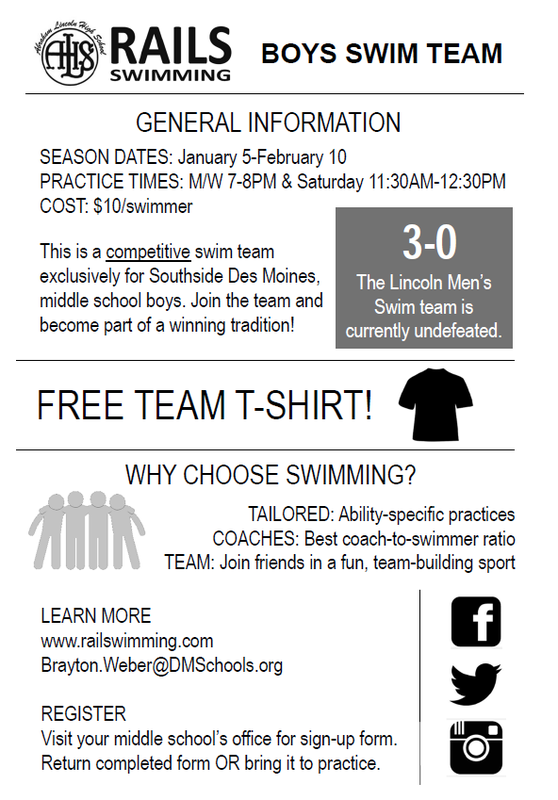 View/Share the MS Boys swimming flier. Note: All SDMS swimmers who are also middle schools boys will need to pay the $10 participation fee for this season. This is due to a DMPS policy change.